The man Barron's dubbed "the ultimate Wall Street pro" returns witha stunning follow-up to his bestselling Trader Vic--Methods of aWall Street Master ("The best investment book of 1992"--The StockTrader's Almanac). Take an advanced class in his patented tradingand investment philosophy and learn how the master makes betterinvestment decisions . . . deciphers economic theories and usesthem to predict investment outcomes . . . cuts through the lies,fallacies, and distortions that muddle and confound trading andinvestment decision making . . . and much more! What the experts said about Trader Vic--Methods of a Wall StreetMaster . . .
"Victor Sperandeo is gifted with one of the finest minds I know. Nowonder he's compiled such an amazing record of success as a moneymanager. Every investor can benefit from the wisdom he offers inhis new book. Don't miss it!" --Paul Tudor Jones, Tudor InvestmentCorporation. "Here's a simple review in three steps: 1. Buy this book! 2. Readthis book! 3. See step 2. 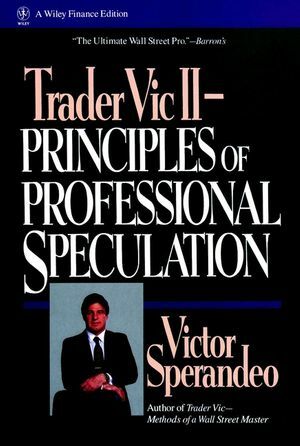 For those who can't take a hint, VictorSperandeo with T. Sullivan Brown has written a gem, a book of valuefor everyone in the markets, whether egghead, novice, or seasonedspeculator." --John Sweeney, Technical Analysis of Stocks andCommodities. "Get Trader Vic--Methods of a Wall Street Master by VictorSperandeo, read it over and over and you'll never have a losingyear again." --Yale Hirsch, Smart Money. VICTOR SPERANDEO is a professional trader and money manager of twenty-five years' standing. He currently manages institutional and large individual portfolios for Hugo Securities Company Inc. and The Professional C.T.A. Fund. In 1971 he founded Ragnar Options Corporation and founded Hugo Securities, a trading partnership, in 1979. His success has brought him profiles in Barron's and The Wall Street Journal, frequent appearances on CNBC and other networks, and perennial popularity as a lecturer. He is the bestselling author of Trader Vic-Methods of a Wall Street Master (Wiley). The Fundamental Principles of a Sound Investment Philosophy. The Economic Principles of Market Forecasting. Money, Credit, and the Business Cycle. Political Influences on the Business Cycle. Applying Macrofundamental Analysis to Economic Forecasting: AnOutlook for the 1990s. The History and Future of the Dollar. Volatility, Opportunity, and Growth of Gross NationalProduct. The Stock Market as Economic Forecaster: The Lessons ofHistory. The Technical Basis of Risk-Reward Analysis. The Technical Principles of Market Analysis Applied. The Principles of Technical Analysis Applied. Options: The Key to Triple-Digit Returns. A Professional Method of Day Trading. The Character and Personality of a Trader. Epilogue: The Morality of Wealth.